Starfish need a fair amount of room to move around and scavenge for food. They like to cling not only to decorations such as fake driftwood but also to the tank glass, often letting a couple of arms sway in the water and pick up tiny food particles. The exact size of aquarium that's needed varies by starfish species, mostly determined by their adult size. Smaller starfish, between 4 and 6 inches in diameter as adults, typically do well in tanks that are at least 30 gallons, especially if these tanks are longer than they are tall. Starfish need room to graze along the substrate searching for food, so they need more floor space than wall space. This is the room needed for one starfish. Small starfish species that do well in aquariums include chocolate chip starfish, sand-sifting sea stars and red sea stars. 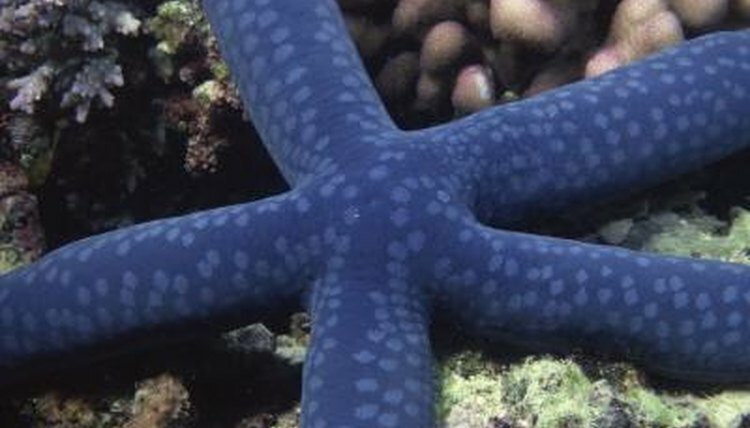 Some larger aquarium starfish, such as the blue linckia sea star, can grow up to 12 to 14 inches in diameter. They need more space than smaller starfish do -- at least a 100-gallon tank for a single large starfish. Adding a living reef or driftwood decorations gives them a bit more surface area to cover when seeking the bacterial films they typically eat. You need a bigger tank if you add starfish. For smaller starfish, you'll need an aquarium that's at least 50 to 100 gallons, depending on how many you add. Multiple larger starfish need more space, such as tanks of 150 or 180 gallons. Starfish tend to be sensitive to changes in the tank water, such as pH levels, temperature and salinity. This can become a problem in tanks heavily stocked with fish. The fish waste raises the water's ammonia level, which can kill starfish. Estimate the length of your fish from tip to tail in inches, then plan to include no more than 1 inch of fish for each 6 gallons of water. This ratio will keep the ammonia levels manageable for your starfish. For example, if you have a 100-gallon tank, subtract 10 percent for the substrate layer, or subtract more if you have deep sand or gravel. Divide 90 gallons by 6 to get 15 inches of fish that can reside with your starfish. If your fish are each 3 inches long, that means five fish. This is just a rough estimate; five narrow fish won't produce as much waste as five fish who are as tall as they are long.